The 2008 presidential campaign has had the largest online ad spend of all other U.S. presidential elections combined. With that said, we still have a long way to go to catch up with traditional media when it comes to total dollars spent. As of September 2008, TNS Media Intelligence estimated that the candidates have spent an estimated $7 million in online advertising and estimated $300 million on TV since February of 2007. To put it in perspective, the 2008 Presidential election online ad spend was just over 2 percent of the traditional media spend for the same period of time, compared to an estimated 7 percent of total ad spending in the US. So on pure percentages, these presidential campaigns spent less per dollar than the average US spend. More interesting than the unprecedented amount of dollars which are being spent, both on and offline, is how they are spending it and the wildly different strategies they are employing. With election day closing in and Obama dominating TV and Radio with his massive amounts of money, it seems the McCain campaign has doubled up on their online efforts , McCain’s display ad impressions jumped by over 250 percent, and his text-based search ads increased by over 40 percent in August and September. In contrast Obama’s keywords consisted mostly of variations of candidates’ names; they bid on very little issue related keywords. And even on the keywords Obama was bidding on, McCain was out performing him. 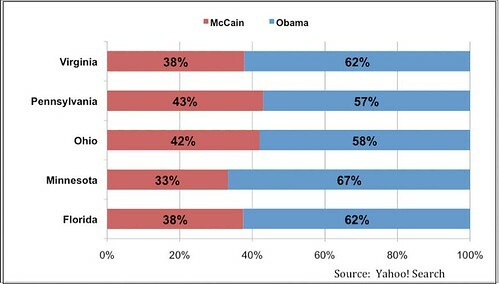 In fact the McCain campaign was faster than the Obama when he announced Biden for VP. They had landing pages and campaigns ready to go instantly. When the Sarah Palin “Branchflower Report” was released, the McCain campaign immediately bought up all the related keywords like “Branchflower Report”, “troopergate”, “Palin report” and others. They were testing various creative and created custom landing pages w/ tons of information to refute the report, successfully diverting some of the traffic to the original stories which would have been more damaging. Not only that, but they turned it into a fund raising opportunity with a donation form right above the fold. In fact, on Oct 31 while finishing this post, when I searched for Barack Obama on Google, position 1 and 2 were a John McCain site and GOP Party site with custom landing pages. 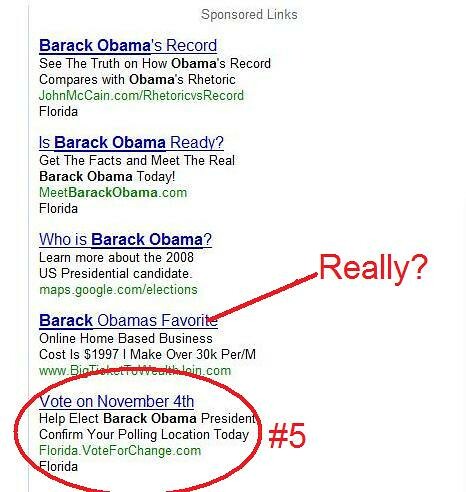 Where was Obama’s PPC ad? In Position 5! In non paid search organic traffic or SEO, Obama has a huge lead with an estimated 4.5 million unique visitors, more than double the estimated 2.5 million visitors to McCain’s site from search engines according to Nielsen Online and Compete.com. Obama also has the Social Media space on lock. He dominates McCain in views, followers and interaction. One thing that’s very obvious when looking at these numbers. 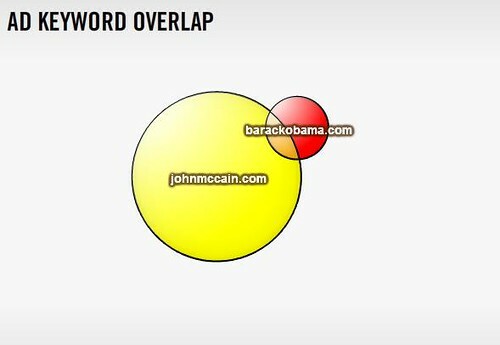 The McCain campaign dominated Paid Search, and the Obama campaign out spent and strategized them everywhere else. According to WSJ/Neilson, in July the McCain campaign had 15 Million Search text ad impressions, as opposed to 1.2 Million for the Obama campaign. 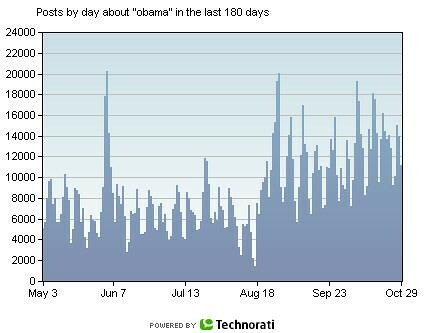 In contrast Obama campaign had 416.7 million image ad impressions, compared with McCain’s 16.5 million. That means that McCain was out buying Obama in Paid Search by 22 to 1 search ads according to Nielson. (PDF Download). Obama’s image ad impressions fell sharply by nearly 50 percent, and his sponsored text-based ads were down nearly 20 percent as well. 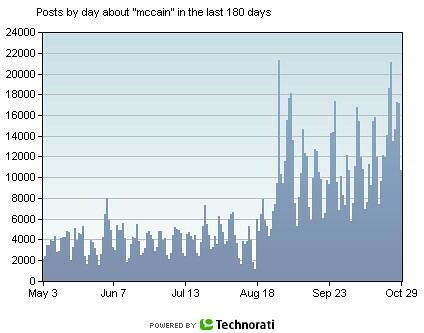 John McCain’s campaign stepped up its online advertising in August, particularly in image-based impressions, which increased 254% month-over-month. Sponsored search links were also up for the McCain camp – by 43%. With the campaigns finally coming to a close and with the clear differences in marketing strategies and availability of funds between the McCain and Obama campaigns, I wanted to dig a little deeper and take a look at how both the candidates had used Search Marketing and Social Media and if they had been effective. 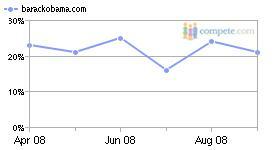 As mentioned earlier, in paid search McCain has consistently outbid and out spend Obama. In addition, McCain’s strategy has had a much larger scope than Obama’s with McCain having close to 9 keywords for every 1 of Obama’s. 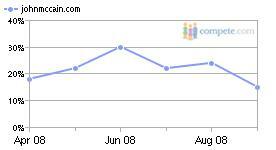 The McCain campaign has executed a multiple pronged approach with their search campaign. First they were bidding on issue or peripheral type terms, like “gas prices”, “abortion”, “Iraq war”, “U.S. economy” and “housing crisis,” which take visitors to Web sites outlining Sen. McCain’s plan on those issues. 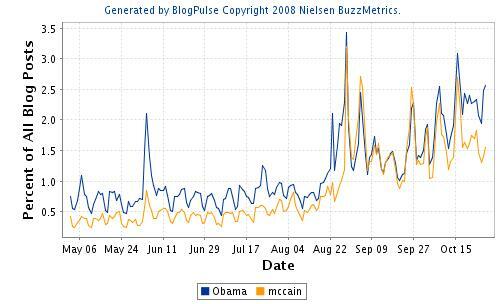 According to Nielsen Buzz Metrics and Technorati on straight blog mentions, Obama also has McCain beat but not by much. And in Mobile/SMS, Obama campaign has a full mobile website containing news, videos and ring tone and wallpaper downloads, where the McCain has neither and a non existent program compared to Obama’s. Digg: Both my.barackobama.com and barackobama.com are listed in the top 1000 sites submitted to Digg. Digg : JohnmcCain site was not in the top 300 sites submitted this year, but “McCain” was the 18th most popular word in title submissions with 1025. Flickr: 3,254 images tagged with “John McCain” and 18,951 images with “John McCain” in text. Below are additional sites I used for quotes, data and graphs. Thank you to all the authors. Dear WPLG (@talkto10) What have you been smoking? Wow! The most comprehensive write-up I’ve seen yet on the Obama-McCain presidential race. I think people will be digging through this information until mid-afternoon tomorrow (Nov 4th). I can’t imagine the amount of time you put into creating this article, it is very much appreciated. BTW, Tribune has seen a lot of the information you mention above in its own analytics reporting. Unfortunately, it wouldn’t be appropriate for me to release the information to the public. I will simply verify that the information you report here is reasonably similiar to what Tribune is seeing across its dozens of news sites including: L.A. Times, Chicago Tribune, Baltimore Sun, Orlando Sentinel, Sun-Sentinel, KTLA, WGN, and WPIX. Keep blogging . . . Very unique analysis! All the different search keywords to be very interesting to see how undecided used search engines to gather information. And your tallies on the different media sites too. Awesome research – thank you for putting it all together. Definitely the most comprehensive I’ve seen. Inspired a post on my blog today about what they’re doing in paid search ON election day. Thank you! @Brent D. Payne Thx for the comments Brent! Also glad to see that the data I gathered, is similar to that of News sites like L.A. Times, Chicago Tribune, Baltimore Sun, Orlando Sentinel, Sun-Sentinel, KTLA, WGN, and WPIX. I’m very impressed with this write up! Rich information worth sharing on Key Word spending! Thank you for this very well researched article. Very enlightening. steprok, thank you very much for your analysis. 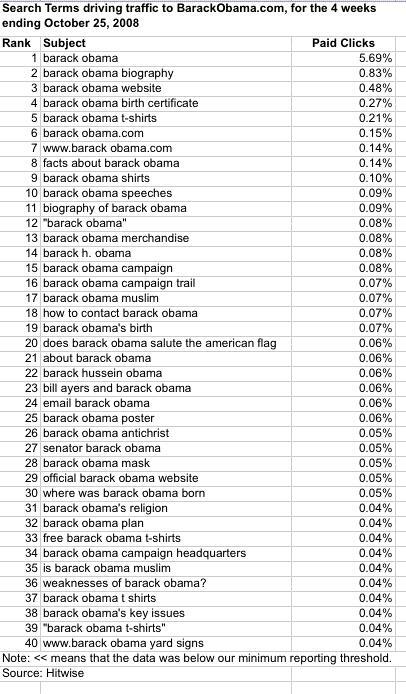 we used your mcchain-obama search-social campaign comparation list as a reference data for our article about obama’s victory. i redesigned your list in photoshop and i wanted to share with you. thanks again. and your work is a good job. i admired. Thx for the comment and the photoshop version of the presidential campaign serarch and social media analysis.